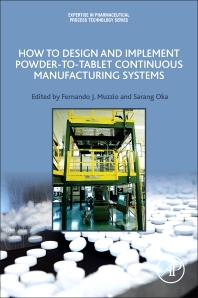 How to Design and Implement Powder-to-Tablet Continuous Manufacturing Systems provides a comprehensive overview of the considerations necessary in the design of continuous pharmaceutical manufacturing processes. This book covers both the theory and design of continuous processing of the associated unit operations, along with their characterization and control. It also discusses practical insights and strategies that the editor and chapter authors have learned. Chapters cover Process Analytical Technology (PAT) tools and the application of PAT data to enable distributed process control. With numerous case studies throughout, this valuable guide is ideal for those engaged in, or learning about, continuous processing in pharmaceutical manufacturing. Fernando Muzzio is a Distinguished Professor at Rutgers University. For the last 22 years, pharmaceutical product and process design has been Professor Muzzio’s main research and educational focus. His research interests comprise continuous manufacturing, powder mixing, powder flow, segregation, compression, mixing and flow of liquids and suspensions, capsule filling, tablet dissolution, and tablet coating. Dr. Muzzio has published more than 260 research papers in this area and his h-index is currently 45. He is a frequent advisor and lecturer at FDA events, and in 2010 he was appointed a voting member of the FDA committee on Pharmaceutical Sciences and Clinical Pharmacology. Professor Fernando Muzzio is also the director of the National Science Foundation Engineering Research Center on Structured Organic Particulate Systems. The center, which has a total budget in excess of $8 million per year, focuses on pharmaceutical product and process design, with special emphasis on continuous manufacturing, particle engineering, and personalized medicine. The FDA and 45 companies, including Amgen, Vertex, Lilly, Pfizer, Merck, Bristol-Myers Squibb and more, are currently members of the center. Dr. Sarang Oka is a process development engineer in continuous manufacturing at Hovione. He is responsible for drafting Hovione’s process development strategy for their continuous drug product portfolio. He liases with Hovione’s customers to enable efficient tech transfer of their products to Hovione’s continuous manufacturing rig. Dr. Oka received his PhD in Chemical Engineering from Rutgers Univesity under the guidance of Dr. Fernando Muzzio. His thesis focused on continuous powder mixing and granulation, and examined the role of continuous manufacturing to enable direct compression, of otherwise directly incompressible formulations. He was also part of the team at Rutgers University that helped develop Prezista, the first FDA approval for a batch-to-cotinuous conversion of a drug product. Dr. Oka holds a BS in chemical engineering from the University of Mumbai.